On Monday 23 January 2012, Lebanese Minister of Labor Charbel Nahas declared unacceptable that the Lebanese continue to hire foreign labor they violate the rights, as they continue to rush to the gates of the embassies in search of work and foreign passports. He added: "I am against the confinement of domestic workers, I am for having a fixed work schedule, but with the possibility of flexibility in specific cases," arguing for a standard contract of work, binding, and refusing the idea of ​​a specific law to foreign domestic workers. Minister Nahas' "revolutionary" declarations came during a conference organized by Insan Association at La Sagesse University in Beirut on "Empowerment and Social Inclusion of Migrant Domestic Workers in Lebanon", while sitting in between the Spanish Ambassador to Lebanon and the Dean of the Faculty of Law in La Sagesse. This is a major shift in policy with previous ministers of labor and came as a surprise to all conference participants. 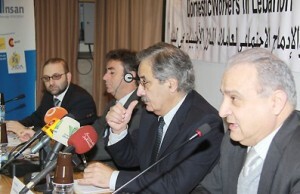 Minister Nahas explained "so-called system of the sponsorship or guarantor (kafala) does not exist in Lebanese law." He clarified that the term was imported from Arab countries where the practice is common, and brought into practice in Lebanon by the Lebanese General Security. Today, Nahas reiterated via his Twitter account his refusal of a bill specific to foreign domestic workers. "Any labor law that takes into account the nationality of the worker is tantamount to racial discrimination," he wrote in Arabic. Earlier in 2011, UN Special Rapporteur on Contemporary forms of Slavery, Ms. Gulnara Shahinian, refrained from suggesting to abolish the sponsorship system in Lebanon because, as Ms. Shahinian has said, she did not have time to explore the alternatives to the sponsorship system, and she did not view labor laws as a viable alternative. Equally, minister Nahas is going against the current global legislative trend which separates domestic work from normal labor as embodied in the recent work towards a Convention on Decent Work for Domestic Workers. Minister Nahas' overarching policy in the ministry of labor is to favor Lebanese over foreign workers. This has recently led to a significantly higher rate of denial of work permits to foreigners requested by Lebanese employers. In the words of minister Nahas, "we cannot keep exporting our youth and importing foreign workers".